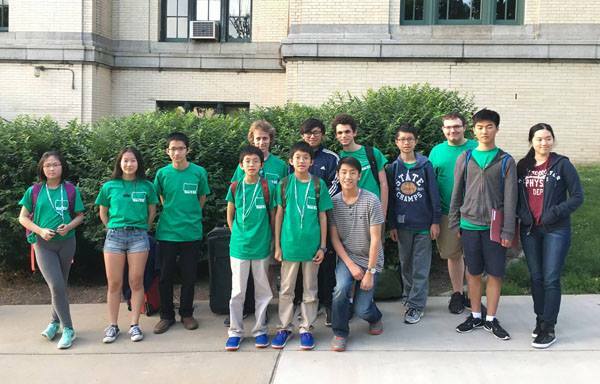 The Western PA ARML team is a math team for middle- and high-school students in the Pittsburgh area. Competitive math gives students problems that are challenging and fun in order to build problem solving skills and provide depth and breadth far beyond the standard curriculum. Our name is derived from the primary competition for which we practice, the American Regions Mathematics League (ARML). Practice typically involves short presentations, problem solving, and solutions, with a break for food and some random puzzle that may or may not have to do with math. The team is run by a passionate group of CMU math students with deep backgrounds in competitive math and a love of teaching. The ARML team is decided by scores from several competitions throughout the year, finishing with our team selection quiz in late April. Practices in May focus on practice competitions to prepare for ARML. ARML takes place at Penn State University the Saturday following Memorial Day (usually the first week of June). The competition has several rounds and takes the bulk of the day. Students enjoy both the We send a team of 15 students, which is selected in April. Due to recent growth of the team, we hope to send a second team of 15 to ARML 2019. A select group of students travels to compete in the Harvard/MIT Mathematics Tournament and Princeton University Mathematics Competition (both in November). These are similar in style to ARML and are regarded as two of the most difficult American math competitions. Carnegie Mellon Informatics and Mathematics Competition is a similar style competition, right here in Pittsburgh, for which students students organize their own teams. We do the Mandelbrot Competition during practice throughout the year, and occasionally use practice time for other competitions. More information about all of these competitions can be found through the links page. The Western PA ARML team was founded in 2008 by CMU professor Mor Harchol-Balter. She coached the team for several years, followed by Misha Lavrov, then a graudate student in the math department. The team has since been coached by a group of graduate and undergraduate volunteers. Our performance at ARML has steadily improved over the years. We finished 3rd in ARML's B division in 2012 and have since been climbing up the A division to 57th, 43rd, and 34th in the last three years respectively.